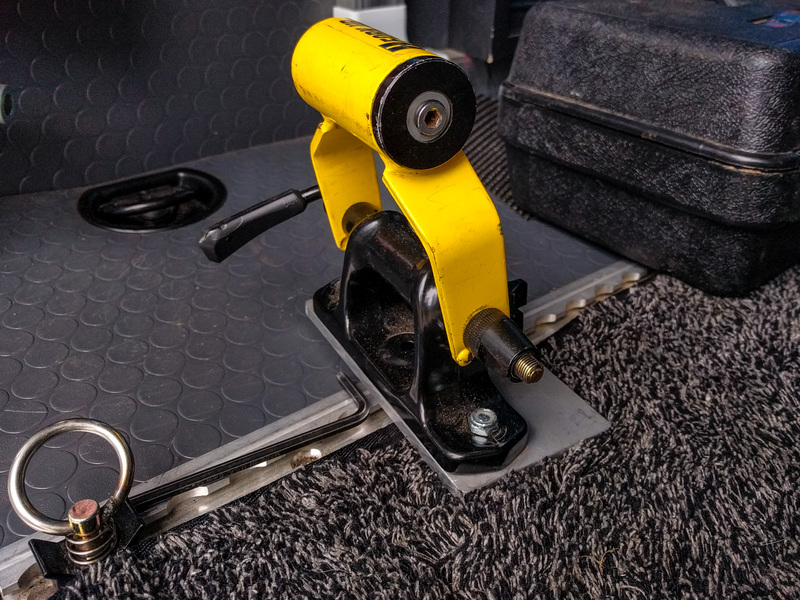 We’ve got L-track mounted in the floor of our van. It’s ideal for placing bike fork mounts pretty much wherever you need them. Here’s how to build your own fork mount that attaches to any piece of L-track on your floor or wall. In this post we’ve linked to a bunch of Amazon items. Don’t feel obliged to buy your stuff from Amazon, but it’s an easy way to check out exactly what we’re talking about. Also, if you do click through from this site and buy stuff, we make a small commission at no cost to you. All the ingredients you need for making the mount. Aluminum bar stock, one of the two L-track studs shown here, threaded knob, and elevator bolts. The foundation of this design is a piece of 3″ x 6″ 1/4″ thick 6061 aluminum bar stock. Depending on the fork mount you buy and your preferred design, you might want to buy larger pieces of bar stock. It fits into the L-track using L-track studs (or this style of L-track studs with a circular retainer, which might work better for you depending upon how much vertical height you need). The plate bolts down with a 3/8-24 threaded knob. You can use the fork mount of your choice. Hollywood’s mounts have a suitable bolt spacing. If you have a through-axle, try this Delta model. Got a Cannondale Lefty fork? You can always use this Fork Up converter, but they aren’t cheap. You’ll also need bolts to attach the fork mount to the bar stock. The type you choose will depend on your L-track. If it’s completely recessed in the floor, you’ll want low-profile bolts like Elevator Bolts. On the other hand, flanged l-track is slightly proud of the floor. You can use regular bolt heads and they might provide just the right amount of spacing to keep the fork mount stable. You’ll need nuts too. 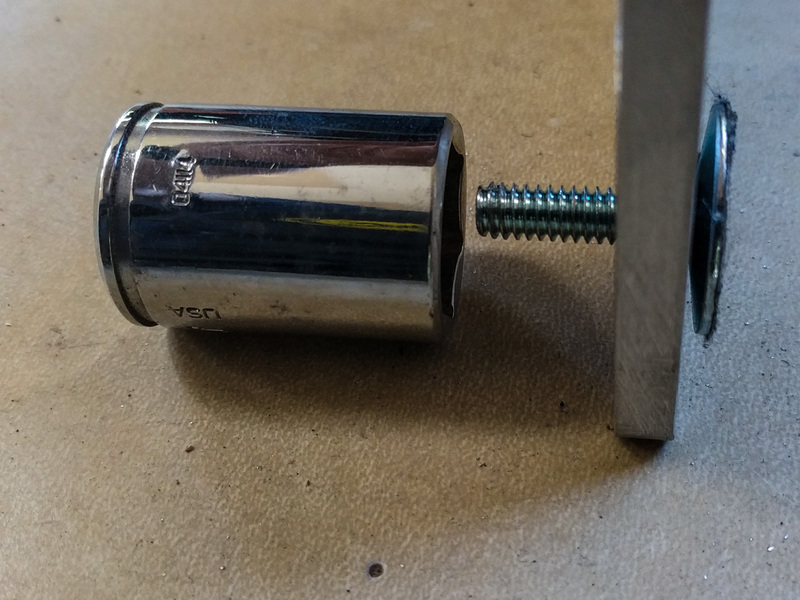 The elevator bolts we used are 1/4″-20 thread so some Nylock nuts like these would be fine. First, work out where you’ll need to drill holes in your aluminum plate to fix the fork mount. Mark the holes along one edge of the aluminum. Now, on the opposite edge, mark a location for the L-track stud and threaded knob to pass through. 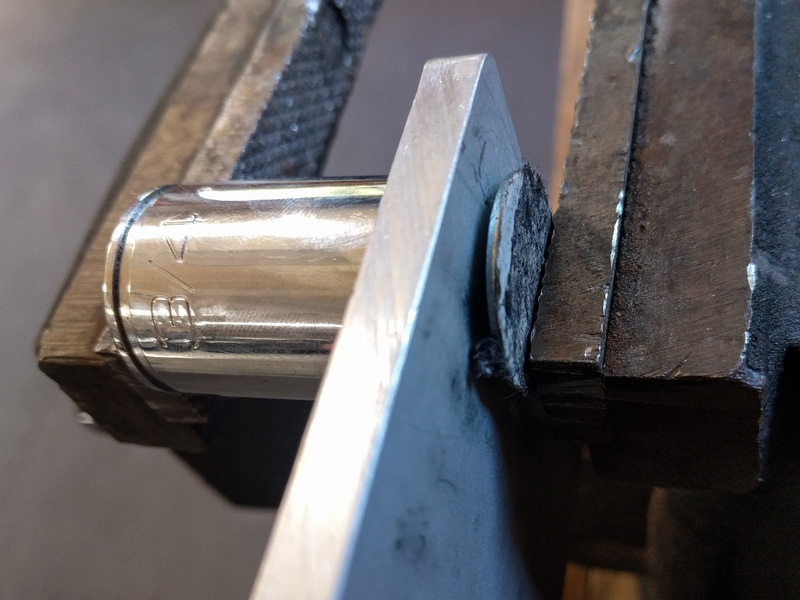 We went 3/4″ in from the edge, centered along the long edge of the aluminum. Drill the holes for the fork mount bolts and the L-track stud. Clean the edges of the holes with a deburring tool. Now clean up the edges of the aluminum. This makes it less likely that the piece will damage you while you’re using it. Also, paint adheres better to smooth edges than to sharp corners. If you have a bench grinder, you can use that but even 80-grit sandpaper is enough to just take off the sharp corners and edges. After using 80-grit or the grinder, move to 120-grit to smooth out the finish. We were in a rush to leave on a trip when we made the fork mounts in these photos, so they have very little finishing on their edges. All we really did was round the corners over to stop them from impaling someone. You can paint the aluminum if you want. Sand the whole surface with 120 or even 200-grit sandpaper, clean it with detergent, rinse it, dry it well, and then prime with a primer that sticks to aluminum (this Rustoleum one works). After that, you can spray it any color you want. If you are using elevator bolts, they have a square area under the head that you’ll need to press into the aluminum. It helps if you drill the hole for the bolt slightly oversized, but still small enough that the square section under the bolt head doesn’t slide into the hole. 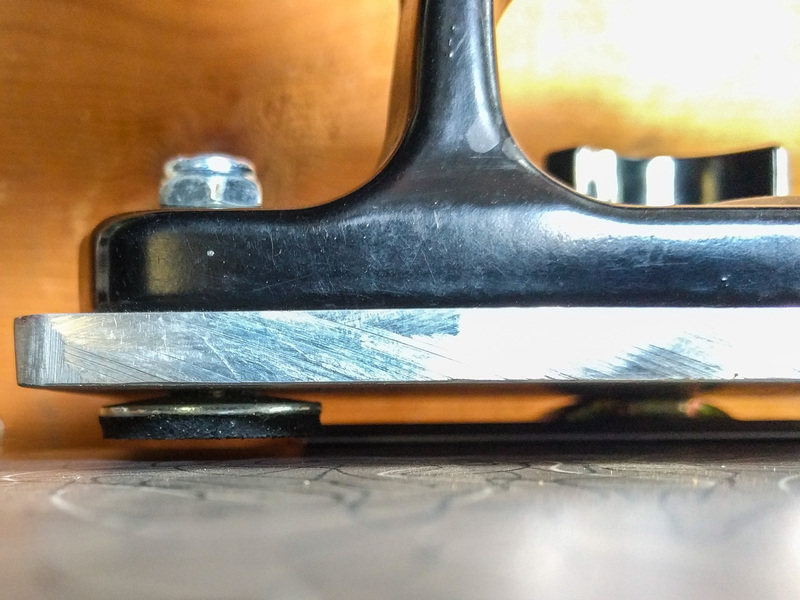 Remember, the square part needs to bite into the aluminum so that the bolt doesn’t turn when you tighten the nut down on to it. Put the bolt loosely in place, and cover the threaded side with a wrench socket that is longer than the threads. Now put this in a vice and clamp it down, or if you don’t have a vice, tap the bolt head with a hammer. This will press the square section of the bolt into the aluminum and hold it firmly. Now it’s time to bolt down the fork mount and attach the L-track stud. With the piece assembled, check that it doesn’t rock from side to side. If it does, you can glue shims on to the underside of the metal. We used some rubber mat, but plastic or metal shims would do just as well. There’s space under the aluminum plate. Use rubber or plastic to shim to the correct height. We have a loose mat in our van that this plate rests on, so the shims in this picture are actually OK for our situation. We’ve found that these fork mounts are super-useful. You can position them wherever you want and on whatever angle you want. They are much more flexible to use than if you’d just bolted the fork mount to a plank of wood. 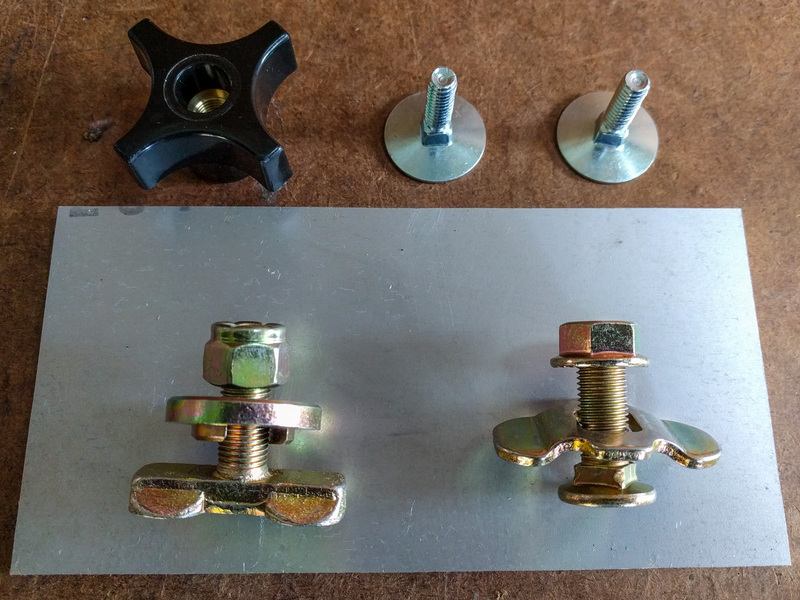 If you wanted, you could drill holes for two L-track bolts to fix the mount more firmly, but we like the ability to turn the mount to any angle. 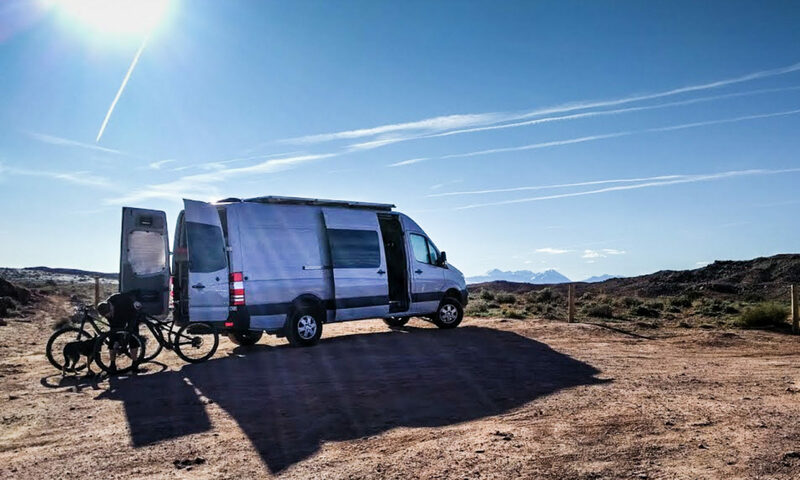 If we have friends’ bikes in the van, we can quickly move the mounts to accommodate their different setup. They also remove really fast, so if we need to use the van for some non-biking activity the mounts can get thrown in a plastic tub out of the way or just bolted to one of the wall mounted pieces of L-track. Sweet! Thanks for posting this. Super helpful! Nice! I did a very similar bike mount. Really inexpensive. The only difference is that I used a longer base plate with a couple of different mounting holes. We found that using a larger base plate allowed us to stagger handlebars. Particularly useful when mixing MTBs and drop bars (plus thru axle and qr forks), or trying to get four road/gravel/cx bikes in. But I love the smaller profile of yours! Very clean. I may have to revisit ours and see if I can cut down the base plate a bit. Do you find that the track channel on the floor of the van fills with dirt? Is it a pain to clean out? Great job on the site, very informative. Fionn, we thought the L-track was going to get completely filled up with mud and gunk. We even bought plastic filler strips for it. However, now that we’ve been using it for a couple of years we’ve found that it does not get very dirty at all. The filler strips are still in their plastic bag. I think we’ve vacuumed the track a couple of times but there’s never been a situation where the L-track mounts wouldn’t move freely in the track and it still looks pretty shiny. Of course, if you were directly filling the back of the van with a load of topsoil or something then I’d imagine it might get a little messy. But that’s not something we intend to do, and laying a blue plastic tarp down when we’ve carted landscaping bark chips around was enough to make sure everything stayed clean. That’s excellent, thanks for the quick and comprehensive reply! I live in Europe (Ireland) and that type of track isn’t really available here, so I’m considering using UniStrut as an alternative. Not as convenient to relocate the attachments by any means but should do the job. Fionn, there are several European suppliers of L-track. Check out Wistra for instance. Unistrut is much more industrial. Obviously it would work, but I might be tempted to look at other T-slot style extrusions if you can’t get L-track. Thanks, I’ll check those out. Hopefully shipping length won’t be an issue. The main issue with Unistrut is it’d not really designed for holding loads along it’s length. Cool. Also check out Unwin for L-track. They are a UK company. They make some cool accessories that we can’t buy in the USA, like seat fixtures and whole camper van kits. We made similar plates, except with a variety of bikes in the garage, needed to be able to accomodate traditional quick release, 15 x 100 (and just added a 12 x 100), and 15 x 110mm boost. My solution was to put a 15 x 100 and 15 x 110 on opposite sides of the plate. Trad quick release is on a separate set of plates, as it’s our road bikes that are still QR, and we might need MTB and road mounts at the same time. That’s a smart move. So long as you still have space to reach the bolt that you use to screw the plates to the L-track, adding two mounts per plate saves weight, space, and time. Thanks for all the inside tips.